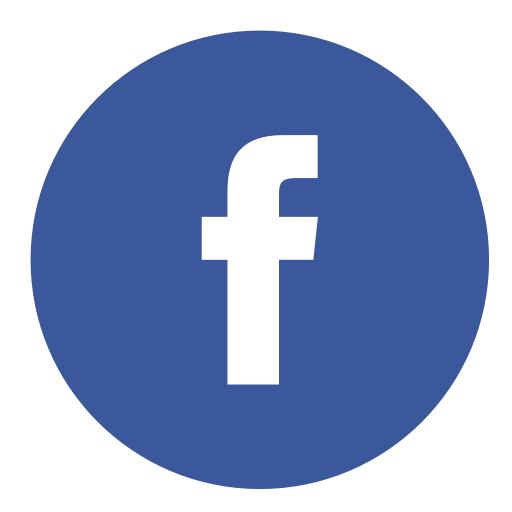 "We are very pleased with Aaron's work on our project. 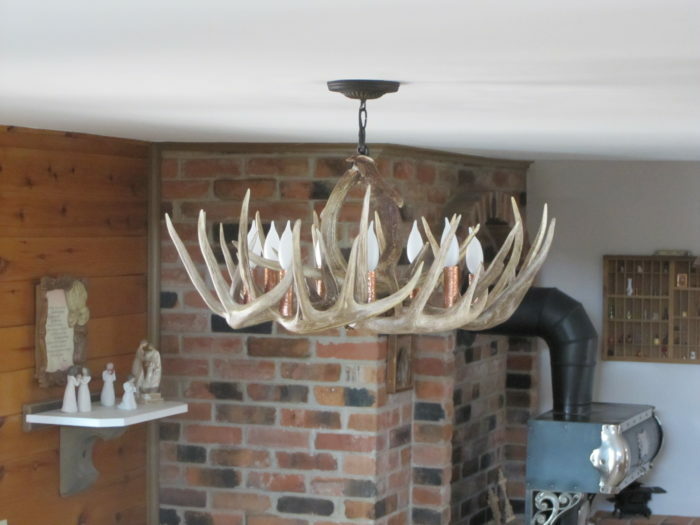 We needed a number of antler chandeliers- all custom made. 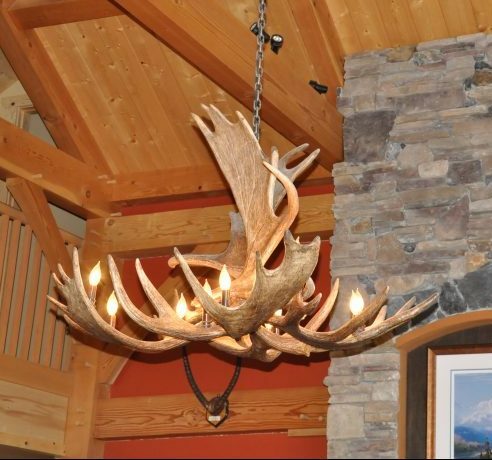 We have used companies in the past, but Alaska Antler Works exceed all of their work. We are very pleased with their quality of work produced, and especially how they were able to deliver the products within the promised schedule for our project in Columbus, Indiana." Patrick Thomas, Sunshine Designs, Inc.
"Well, I finally got my desk last night and all I can say is WOW!!!! Aaron, it's absolutely gorgeous! I want to get my office fixed up and then I'll send photos. It fits in my office beautifully. You did an amazing job. It's a work of art! If you need a referral ever, I'm your girl! I will send photos soon! Thank you so very much. I couldn't be happier!" 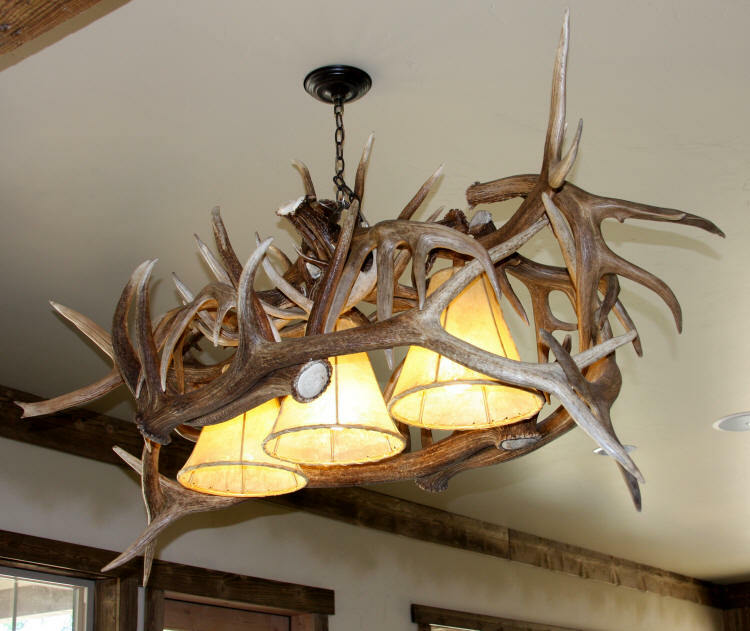 "We are the proud owners of two beautiful whitetail antler chandeliers made by Alaska Antler Works. 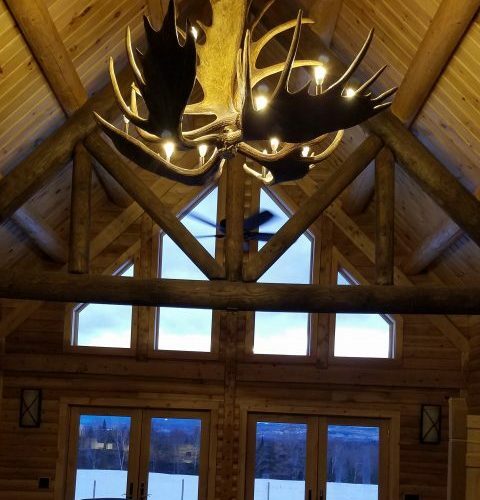 The artistry and craftsmanship on these four tier chandeliers are absolutely stunning and have added so much beauty to our hunting lodge. We loved working with Aaron and Jill and will be forever grateful for their personable and reliable work ethic." 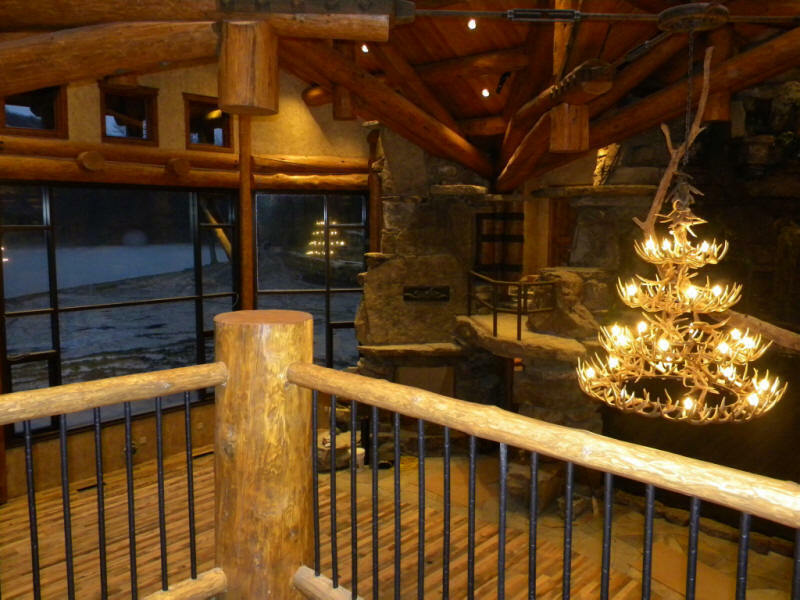 "Let me start by saying how thrilled we are with the chandelier made by Jill and Aaron! It is truly a work of art in our new house. I have to admit I was a little nervous spending that kind of money on a product sight unseen, but Jill and Aaron did everything they said they would, on time, and then some. I was also impressed with the care taken to ship our chandelier to the east coast. 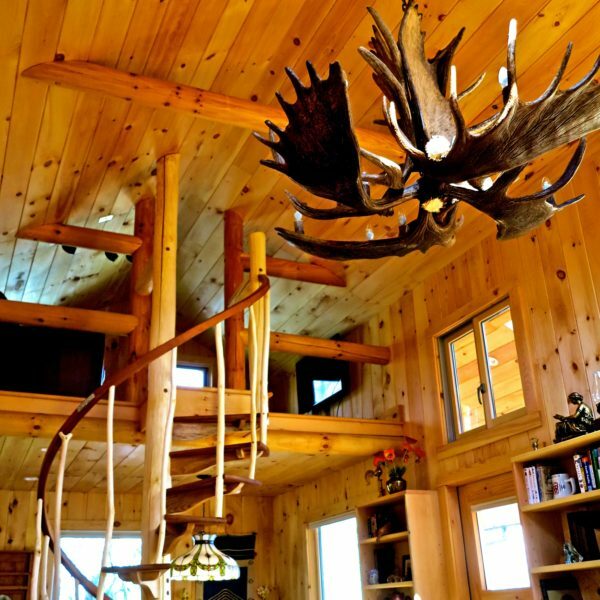 I absolutely recommend Alaska Antler Works! 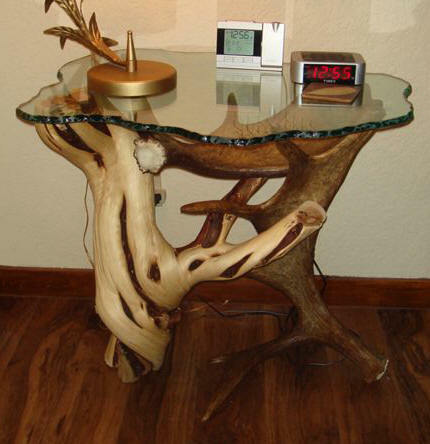 If I am ever in the market for another piece I will go to them first." "Every once in a while you run into a real find, a treasure. Such was the case when my wife and I discovered Alaska Antler Works owned by Aaron and Jill Bork. We had been seeking a unique table and benches that would accent the view from a glass enclosed dining area overlooking a beautiful lake. 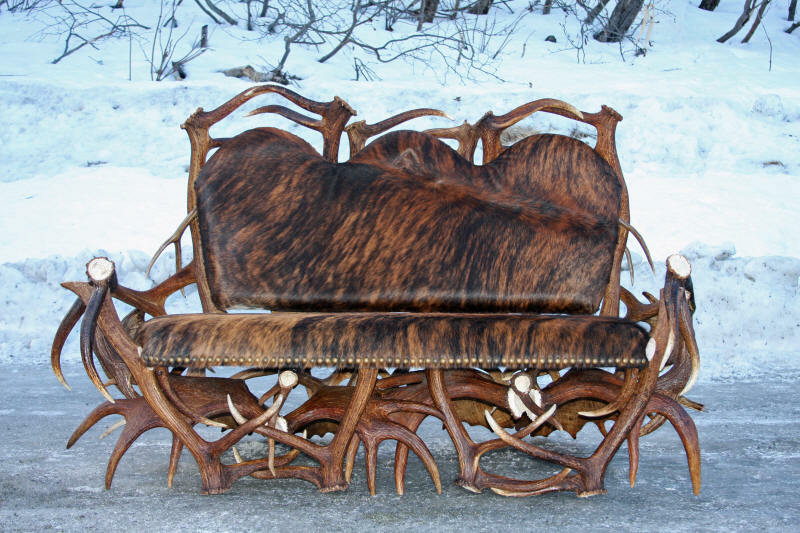 While searching on the internet we found Alaskaantlerworks. Paging through the website, not only did we see the potential for our future furniture but were taken in and entertained by the story of Jill and Aaron. We called and found Aaron to be charming, professional and very driven to create an artwork that would be perfect for our requirement, meeting our exact specifications. Throughout the entire creation Aaron would send us pictures requesting feedback as to our thoughts and comments and if requested, alter his work to more closely fit our vision. The table and three benches now proudly sit in our home gathering the ooohs and aaahs of both family and friends. Aaron and Jill not only have the talent and vision for building these pieces of functional art but also are truly customer service oriented, sincere and timely. 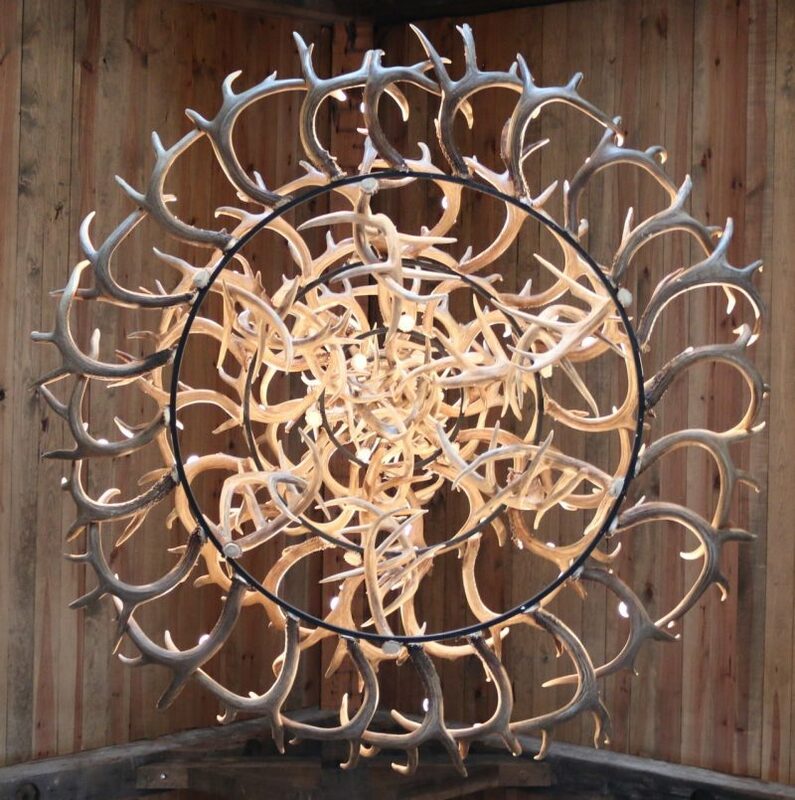 With Warmest Regards"
"To Whom it may Concern, This letter is written as a glowing reference for Aaron Bork and his firm Alaska Antler Works. 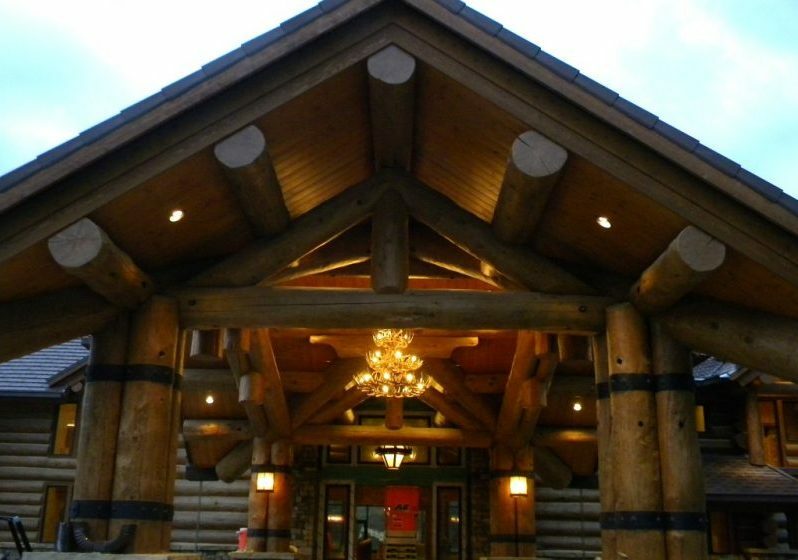 I have 2 Country Houses, and had previously purchased a small Moose Antler chandelier, which was fine but not nearly grand enough for the log cabin I was building on a private lake. 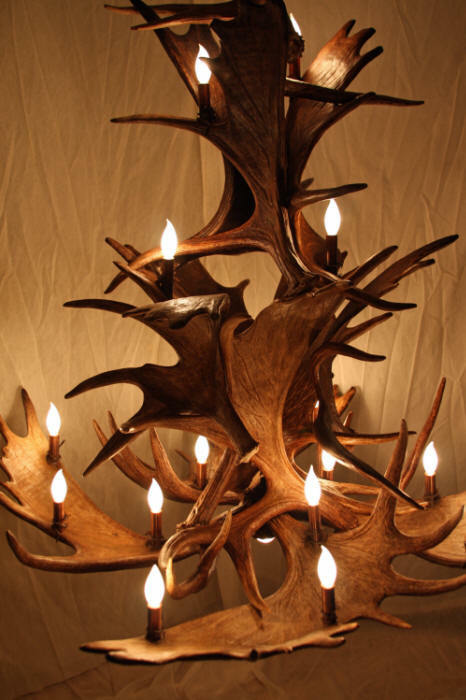 I thoroughly researched the web and interviewed many Moose Antler Chandelier makers. I chose to go with Aaron and his company. I could not be more pleased with my chandelier….Almost 5 feet in diameter and almost 4 feet in height it is a SPECTACULAR addition to my Living Room, suspended from a 22ft high ceiling, it floats above the room the room like an Angel. 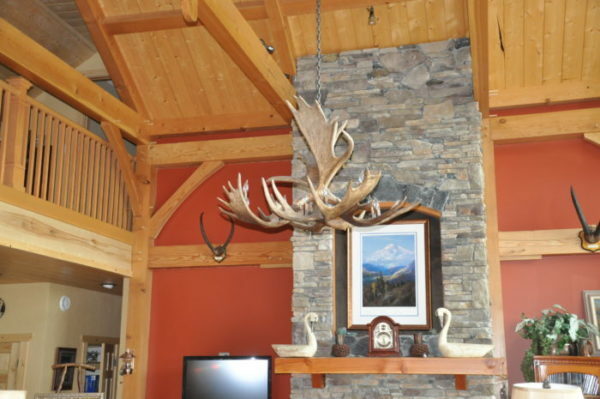 I have no hesitation in recommending Alaska Antler Works. Aaron Bork and his wife Jill are professionals in every sense of the word. They are scrupulously honest and fair and anyone who is lucky enough to do business with them will be more than pleased with the Art piece they produce. They do create works of art." "I was very pleased with Aaron's willingness to work with me on the custom dimensions. 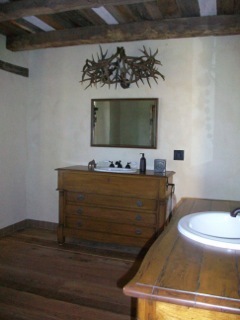 And my clients are very pleased the atmosphere I created using the antler fixtures. Thanks for your help...I hope to have another opportunity to work with you." 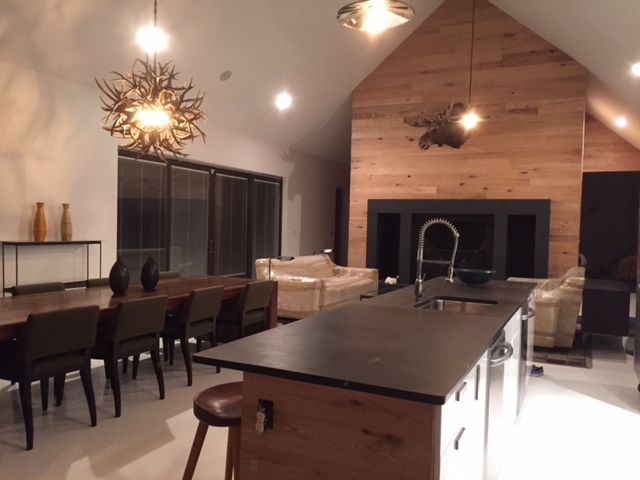 “I am extremely happy with the chandelier that Aaron made for me. I was apprehensive when I decided to trust someone whose work I had never seen in person, but his website convinced me that it would be a good choice. The chandelier arrived safe and sound and when it was hung, it was spectacular. It really made the foyer look special and the quality of the chandelier is very high end. Out of curiosity I googled Ralph Lauren’s imitation of the same item and was appalled at the prices. Aaron’s work surpasses the RL quality since it is made by hand, by an artist who really cares. I cannot recommend his work enough." 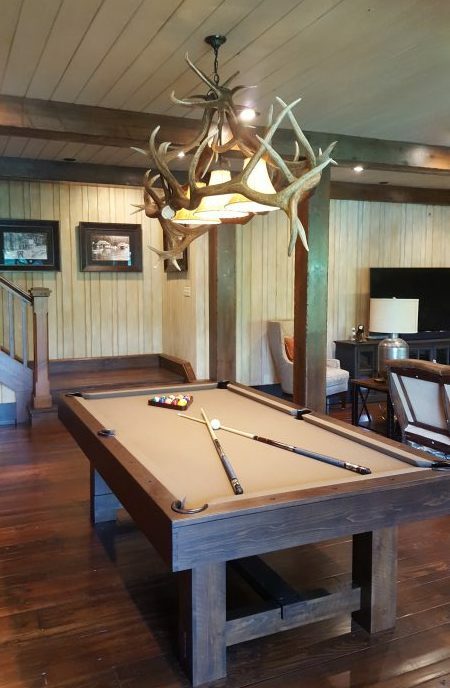 “We purchased an antler chandelier from Alaska Antler Works for use over our pool table and could not have been more pleased with the process. I identified them through a web search, and was able to contact the owner/craftsman directly. Aaron and Jill answered my questions, coordinated shipping and followed up with me on the experience. I have been completely satisfied with the purchase and will use them again when the need arises, and will highly recommend them to others!!" 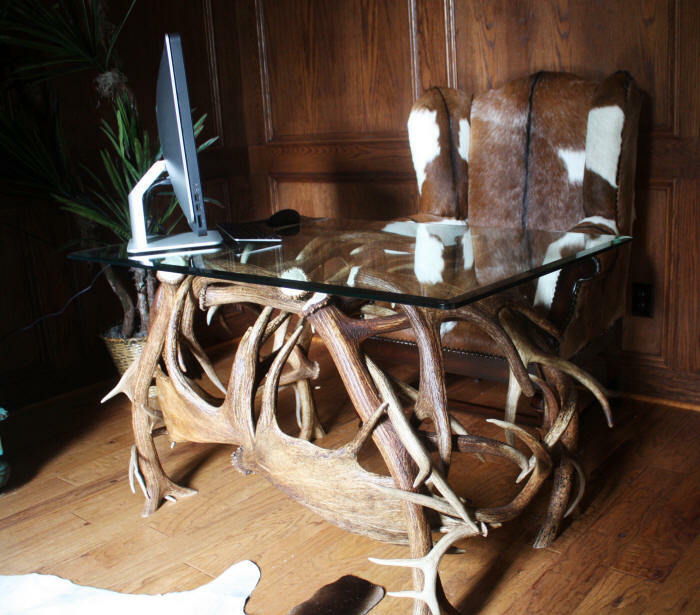 "Jill & Aaron at Alaska Antler Works were such a pleasure to work with. Their quality and expertise is exceptional. I have ordered everything from custom lighting, to just simple decorative horns, and everything has been top quality and just beautiful. They are very accommodating and have a quick turnaround. They can make just about anything! All in all a pleasure to work with. Will definitely use them for future products!" "I dare you to find another artist with the talent that Aaron has. 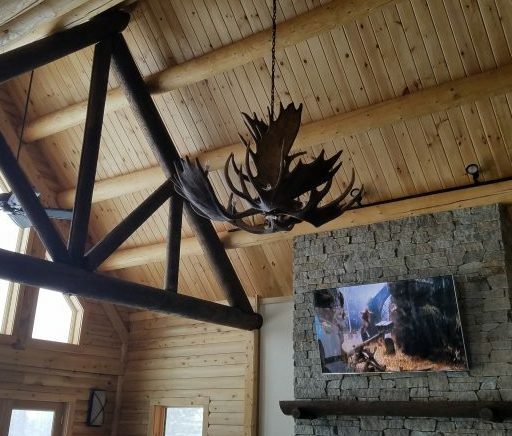 I had a very sentimental piece done, and was more than “pleased” or “happy.” I gave Aaron a collection of antlers that took my later father nearly 60 years to amass, one at a time. To even let go of that collection was hard, let alone the thought of anyone drilling in it! But what came back to me from that already special pile of calcium ‘n’ bone was a work of art that makes my heart sing. My trust in his ability was well-founded, and I regard the chandelier he created to be not only one of my prized possessions because of the beautiful engineering artistry that now graces my home, but because it is a tribute to my late father, and Aaron sensed that. Only the most talented can handle this level of expectation, and deliver ten fold." "We just love the chandelier. It is the crown jewel of our cabin. Everyone loves it that sees it. Our table is very functional and beautiful. With kindest regards,"
"These tables are stunning. 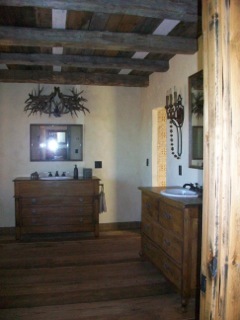 The workmanship is fabulous. I often come up with ideas and can find no one who will really listen and make exactly what I want, until I found Jill & Aaron. I sent them a very raw sketch and they simply made exactly what I asked for. 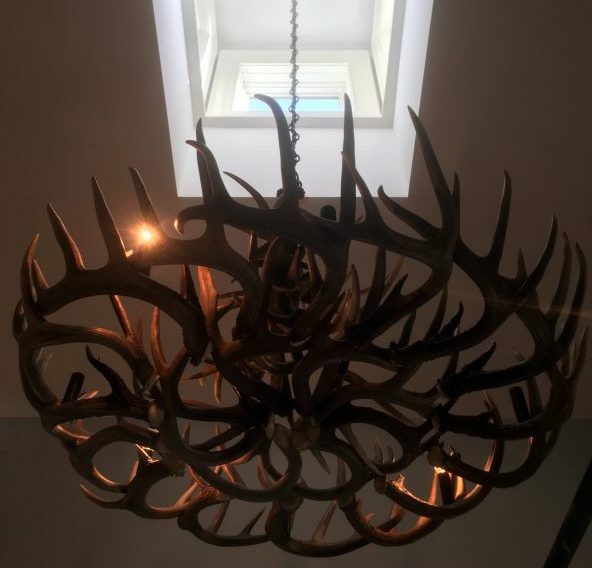 Thank You so much"
"I priced moose horn chandeliers for my new home and found Aaron Bork to have the most reasonable priced chandelier that I found by a long shot. His craftsmanship and service are incredible. You can't go wrong by doing business with Aaron and his wife Jill. 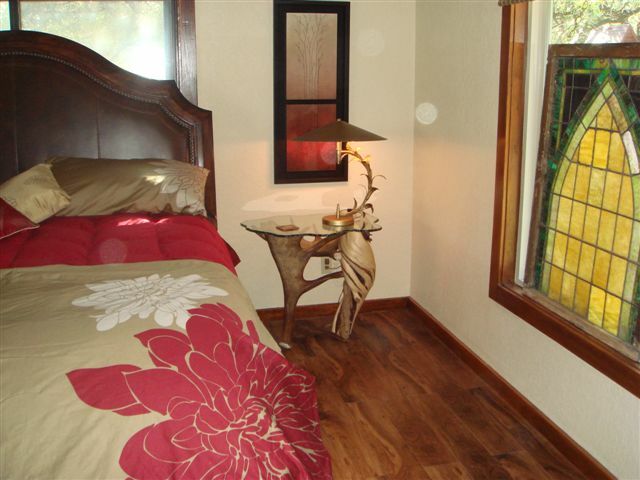 We have a beautiful high end home and their chandeliers just set them off in a stunning fashion." "I just am so happy---it is gorgeous. My coworkers are drooling over this. I just wanted to tell you again how much I love the light. I love what you did with the top swirl, Aaron." 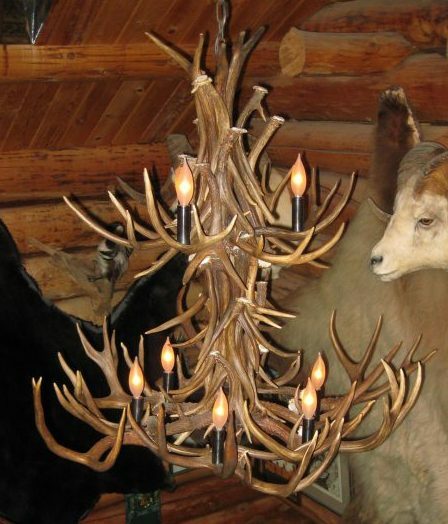 "Just wanted to let you know that we are enjoying the antler light fixture. You did a great job." "Our loveseat is completely awesome! It's the first thing people look at when they enter our home and it is universally admired! It's not only a focal point of our living room, but it is also exceptionally well-crafted. Aaron made it structurally sound, aesthetically pleasing, and safe for our kids--the antler points are all aligned in such a way that you never get poked! We love it as it is a gorgeous, artistic, unique addition to our home that we enjoy every day. It's a locally-made piece of practical art made by an excellent craftsman. " "Aaron really does have a great talent and this incorporates everything that I am looking for in creating my home. I am having everything made from wood, brass, copper, and stone, not plastic. 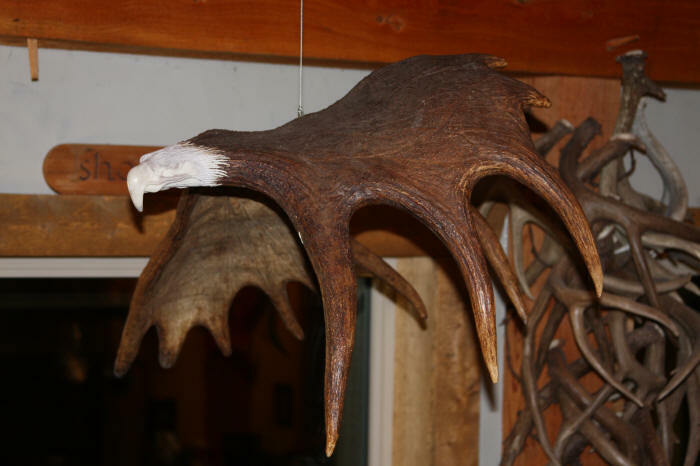 To have an eagle, very artistically hand carved by Aaron on an antler couldn't be any more fitting." "Dear Aaron and Jill, It's a masterpiece ! I got it hung and to say that we are enjoying your work of art would be an understatement. I hope that you can feel my gratitude as I write this. 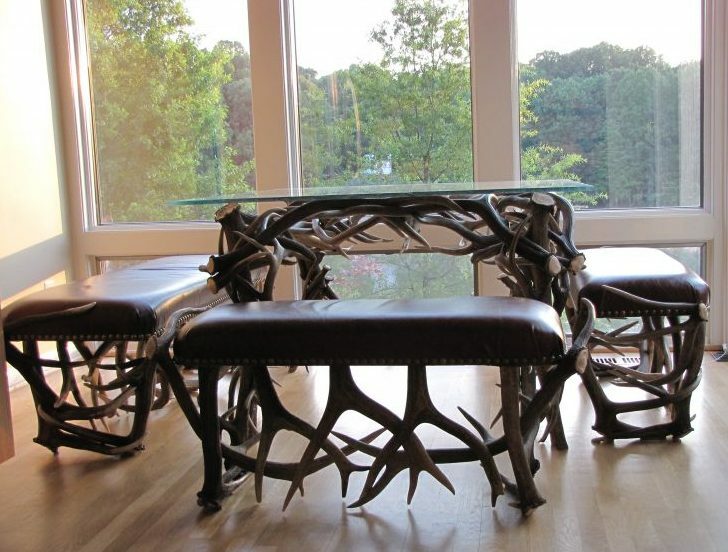 Your attention to detail and appreciation for the beauty of the antlers is beyond measure. I'll be sending pictures. Our family will enjoy this chandelier for years to come. God Bless!"